We are delighted to publish the schedule for the Springtime Sessions taking place on 24th – 26th April. Please see below for details on how to sign up to the individual events. You are welcome to come to as many events as you are able to attend. Please note that a number of the events have limited space. Contact chelseadesignquarter@gmail.com with any further enquiries. We will update this page, so please check back if details of how to sign up haven’t yet been published. 6pm – 9pm The Rug Company Q&A with Christopher Kane & Christopher Sharpe. FULLY BOOKED – please e-mail chelseadesignquarter@gmail.com to put your name on the waitlist. 10am – 12pm “Camberyard Collective Spring Brunch – What do you need to know to design & specify a kitchen” A Bespoke Roundtable & Q&A session with Emma Hooton – Interior Designer, Prinul Polesssi Patel – Made in Chiswick and Rebecca Weir from Light IQ at Waterworks Showroom. FULLY BOOKED – please e-mail polly@camberyard.com for waitlist. 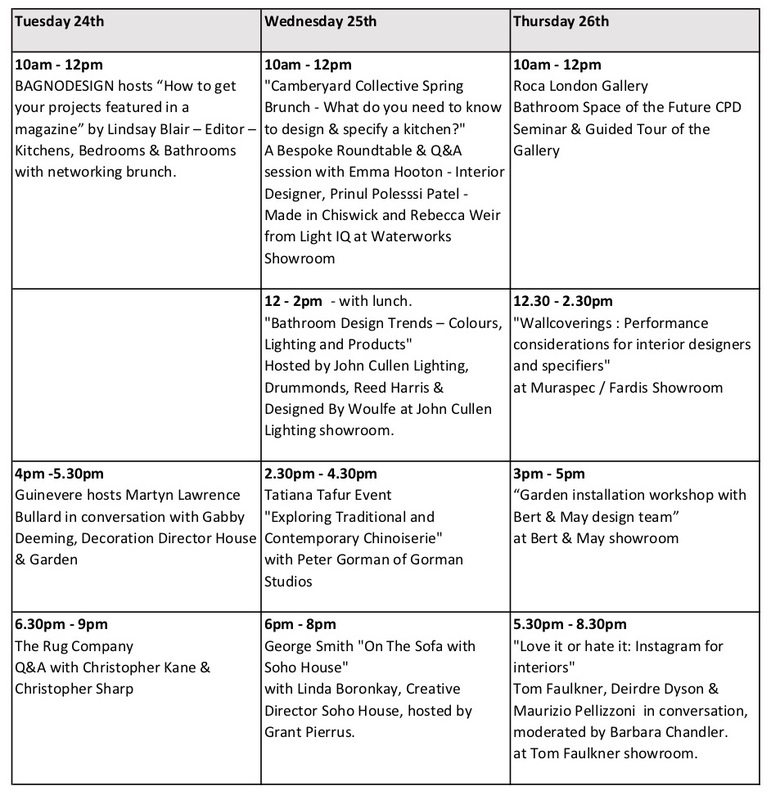 12pm – 2pm (with lunch) – “Bathroom Design Trends – Colours, Lighting and Products” Hosted by John Cullen Lighting, Drummonds, Reed Harris & Designed By Woulfe at John Cullen Lighting showroom. FULLY BOOKED – for waiting list click here. 2.30pm – 4pm Tatiana Tafur Event “Exploring Traditional and Contemporary Chinoiserie” with Peter Gorman of Gorman Studios. RSVP to harriet@tatianatafur.com. 6pm – 8pm George Smith “On The Sofa with Soho House” with Linda Boronkay, Creative Director Soho House, hosted by Grant Pierrus. FULLY BOOKED– please contact gabrielle@georgesmith.co.uk to put your name on the waitlist. 10am – 12pm – Bathroom Space of the Future CPD Presentation and Guided Tour of the Roca London Gallery. Guided Tour’s will take place at 10am and 11am: RSVP here to attend either tour. Seminars will take place at 10am and 11am: RSVP here to attend either seminar. 5.30pm – 8.30pm “Love it or hate it: Instagram for interiors”. Tom Faulkner, Deirdre Dyson & Maurizio Pellizzoni in conversation, moderated by Barbara Chandler, at Tom Faulkner showroom. FULLY BOOKED – please contact elektra@tomfaulkner.co.uk for waitlist.